BIG nutrition in a small package! Black Soldier Fly Larvae are the perfect feeder for juvenile bearded dragons, small lizards, skinks, geckos, chameleons, turtles, etc. 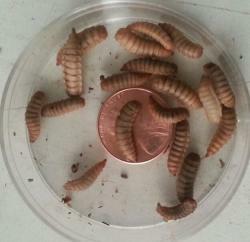 ReptiWorms™ are perfect for the person looking for an alternative to crickets, superworms, mealworms and waxworms. **DO NOT REFRIGERATE YOUR REPTIWORMS™ as normal refrigerators are too cold and can cause them to die. You can store your ReptiWorms™ for several months if you keep them at 50-60 degrees F. When ready to feed, simply take out the amount of worms you want to feed and bring them to room temperature before feeding ... ReptiWorms™ become more active as they warm up and even more appealing to your pet!